It didn't take long for the supercomputer to figure out how anxious I am. Since its introduction to the world in 2009, IBM's Watson supercomputer has been crushing humans in Jeopardy, helping chefs make food with unconventional recipes and even offering tech support. But what happens when the artificial intelligence machine puts its own spin on a photo booth? To find out, I checked out IBM's "Art with Watson: Hidden Portraits," an exhibit that's being displayed in New York City until May 7th. The gallery features portraits of historic personalities like Marie Curie and Nikola Tesla, which Watson helped artists create by feeding them data collected using its natural language and personality insights APIs. As part of this project, IBM is also showing off the Watson cognitive photo booth. 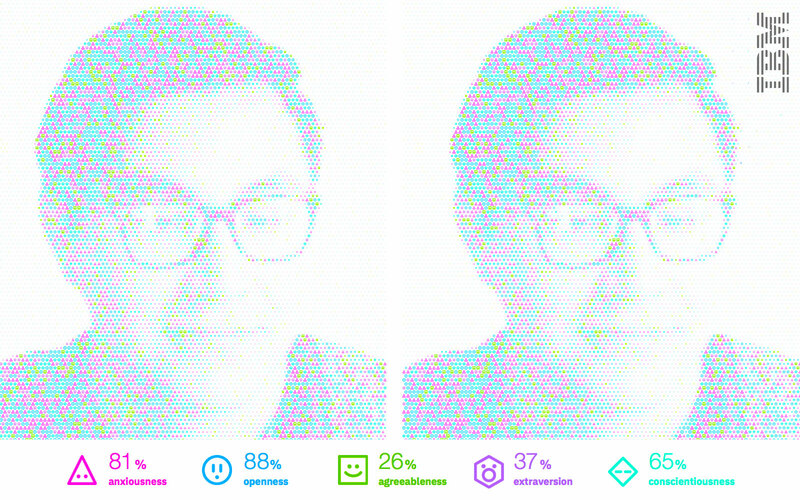 The idea here is for the supercomputer to compose a portrait of you based on five different aspects of your personality: anxiousness, openness, agreeableness, extraversion and conscientiousness. After stepping in the photo booth, Watson asked me a set of questions, such as "Who is your favorite artist and why?" "What did you want to be when you grew up and why?" and "If you could be a movie character for a day, who would it be and why?" Then, it took a picture of me and based on my responses, relying on its speech-to-text and tone analyzer APIs, made a portrait represented by tiny icons of each of my traits. In the lead image above, for example, the color pink represents my levels of anxiety. According to the supercomputer, my anxiousness was 81 percent, which I can't refute given my unfortunate history of anxiety attacks. Watson also found me to be 88 percent "open," something I definitely agree with since I consider myself quite a transparent and honest individual. When you think about it, it's both impressive and scary that an AI could (sort of) figure me out in just a few minutes, and inside a photo booth of all places. But, somehow, I feel at peace with that, especially since the portrait looks pretty damn good. If you're in NYC and want to experience it yourself, the Watson cognitive photo booth will be at the Hidden Portraits exhibit at the Cadillac House in Manhattan's SoHo neighborhood. As for the rest of you, IBM says it plans to bring it to more places in the future, while an online experience that uses your computer's webcam will also be available in the coming days. The company says this is just another way for people to interact with Watson and see its potential across more serious industries and businesses, including education and the medical field.